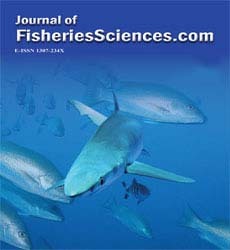 In this study, In order to improve size selectivity of red mullet (Mullus barbatus) and annular seabream (Diplodus annularis), 44 mm knotless hexagonal mesh codend (AGT 44), 40 mm knotless poliamid codend (PA 40) and 44 mm knotless polyethylene codend (PE 44) were in-vestigated in bottom trawls net. Experiments were carried out by R/V ‘EGESÜF’ between 03.02.2009 and 27.08.2009 with 900 meshes modified trawl net in around of Gülbahçe Bay and Hekim Island. A hooped covered codend technique was used for estimating selectivity pa-rameters. Individual and pooled data selectivity parameters were determined with CC2000, mean selectivity parameters were calculated with EC Modeller programmer. Twelve with AGT 44, 10 with PA 40, 3 with PE 44 valid trials were carried out. For red mullet L50 values were estimated 15.2 ± 0.0 cm, 14.2 ± 0.0 cm and 13.5 ± 0.1 cm in AGT 44, PA 40 and PE 44, re-spectively. For annular sea bream L50 values were determined 10.6 ± 0.0 cm, 9.8 ± 0.0 cm and 9.3 ± 0.1 cm in AGT 44, PA 40 and PE 44, respectively. As a result, a lot of fish which have different morphological characters can be caught in Aegean Sea trawl fishery. A mesh size and type appropriate for one species will be unsuitable for many others. Therefore, in addition to size selectivity, species selectivity and fish behavior studies need to be investigated.